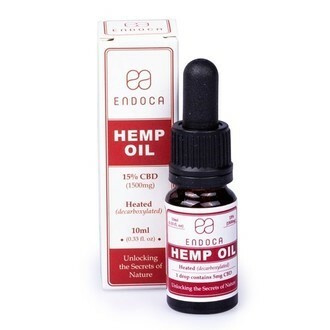 Produced from organic European hemp, Endoca Hemp Oil is a potent extract developed as a dietary supplement for anyone wanting a high dose of CBD. Each bottle contains 10ml of hemp oil, of which 1500mg is CBD. This means each drop contains 5mg of CBD! It gives this oil a total strength of 15% CBD. There are no herbicides, pesticides or additives used in the making of this product. Endoca Hemp Oil (15% CBD) is a premium CBD oil produced from high quality, organic European hemp. Through supercritical CO2 extraction, Endoca is able to produce an oil that contains nothing but the natural goodness and extracts of the plant. The result is a safe, legal, and environmentally friendly CBD oil. Each bottle of Endoca Hemp CBD Oil (15% CBD) contains 1500mg of CBD, allowing each drop to contain an average 5mg. This oil also contains small amounts of other cannabinoids, including CBDA, CBG, CBC and CBN. Endoca recommends using this CBD oil 3 times a day, placing 1 drop under the tongue and holding it there for 1 minute before swallowing. Shake well before use. Store in a cool dark place, such as a fridge, once opened. Do not use if breastfeeding. Always consult a doctor if in doubt. This product is intended as a dietary supplement.